So you have been to the official website to book your tickets for the Caminito del Rey and to your dismay the dates you want are full (agotado). Not to worry as there are two other ways that you can get your ticket. Firstly, stay in a local hotel such as the Posada del Conde or the Garganta Complex. These are the two hotels nearest to the walk that can get the tickets for you. (When you make the booking, make sure that you add a message to say that you are specifically booking because you want to walk the Caminito del Rey.) If the hotels are full then other hotels found on booking.com can help as well such as the fantastic Hotel Magdalena closer to Antequera. Secondly, Just turn up and buy your ticket at the gate. (10 euros each and you can pay by card as well as cash). THIS DOES NOT ALWAYS WORK BUT MANY PEOPLE HAVE COMMENTED THAT THEY WERE ALLOWED TO PAY AT THE GATE. Latest comments are that there are just 50 tickets available (unconfirmed) at the gate and people are turning up to queue as early as 07:30 am! Thirdly, If you are staying in malaga go to a train station and see if you can get the combined ticket…. Click here to read more about the combined ticket! This is because there are a percentage of tickets (6% of the 1100 people allowed in daily.) When you can enter depends on how many people turn up for each allocated time slot. The maximum amount of people that enter every half an hour is 60 people so if you are there to buy your ticket at 11am and there are only 45 people checking in then you will be allowed to go along with that group… If there are 60 people you will have to wait for the next group in 30 minutes time. Even if you do have to wait a while, it really isn’t a hardship to sit and admire tha amazing scenery at the entrance to the Caminito del Rey! I’m planning on visiting on Sunday 9th April. Tickets are sold out! Is it worth taking the risk…? The transport from Malaga only arrives at 10.50ish at El Chorro… I don’t mind waiting, but it would be a waste if I went all the way and then wasn’t able to do the hike…! Hello, any idea what is there to do in the area if the caminito is closed due to wind? Another hike eventually? We also come by train. Thanks! Any chance we get in tomorrow by buying at the gate? On a Sunday I would doubt it…. There are 10 of you? Maybe during the week but as you can imagine weekends are always busier in any tourist attraction. Five of us are going to be there from 11 till 20 April . What days would you recommend? My daughter is seven and an half- tall and fit- do you think that I can try to take her with us? If you are going to just turn up at the gate then as early as possible and better on a weekday but there is no guarentee that you will get in. Hi, we are only in Malaga for 2 nights – 21st and 22nd May and since the hike is closed on the Monday, we are limited to only the Sunday. On the website – this is already booked out unfortunately. We only need x2 tickets. Do you think its worthwhile to show up on the Sunday morning? We don’t really want to travel unless we have a high likelihood of getting in. Hi Felicity… I would say not, it is a Sunday and it is Easter week……. Still, you never know if you got there early enough… I would suggest exploring more of Malaga. So many excellent museums and the castle and the port to explore…. We would like to visit on Thursday 20 th April. Only one ticket is available at 9:30. – we need 3 tickets. Should I pay the one and maybe buy the rest 2 tickets at the gate? That would be a big risk Mia…. Maybe there are no tickets available at the gate on the day you want…. We couldn’t get tickets for Friday 26th May so as you recommended we turned up at about 10:15 at the North Entrance Gate. We were able to buy tickets (two) and go on the Caminito right away! Wanting to visit on Tuesday 1st August but tickets are sold out on the website. We are hoping to go earlier on in the day as we are flying home that evening. There are four of us, do you think it is likely we will get tickets without a very long wait time? today we visited Caminito del Rey and we have not booked tickets online before. We went there around 10 am and only 2 persons. It was absolutely no problem to get tickets and we were directly going on the trail. Thank you for tips. Do you buy the day tickets at the actual entrance? That means a 45 minute walk from the car park. Is that so? I can;t find out any clear information on this. when i want tot buy tickets on the official website for caminito del rey, they show me 2 options one says entrada general and the other one says visita guiada. we wanted to go on the 15th of august but the tickets for entrada general are all sold out. but now there are tickets available for the visita guiada. but what does that mean? is it an organized tour? with a tourguide and how long does that take and is it also worth it? Hi Clive, thank you so much for this info! I was really disappointed when I couldn’t get tickets, but from reading your page we (3 of us) decided to take a chance and turned up yesterday at 9.30am and walked straight in. I’m so glad we did as it was fantastic, albeit very hot at the end, which a cooling swim in the reservoir at the north end (opp the bus drop off point) sorted out. Hi Sarah, thanks for the kind comment and I am glad that you got to walk the Caminito del Rey! I had basically given up on seeing the Caminito del Rey but thanks to your advice I took a chance and took the 10:00 train to El Chorro and hopped on the bus to the north entrance. I got a ticket straight away and was able to enjoy a beautiful day out there. Thanks a million! Me and three friends are planning to go to El Caminito Del Rey in October 17th. The general tickets are sold out online up until 2:30PM which is a bit late since we’re also trying to do a Via Ferrata climb that same day. I was wondering what are the chances of us being able to get tickets if we show up when they open? Also, I did see a guided tour available, is it worth it? Are we able to just buy it and walk it without the tour guide? Also, how often do they close Caminito because of external circumstances like wind/weather? Hi. You can try just turning up, as you can see in the comments here quite a few people have gotin without a problem….. 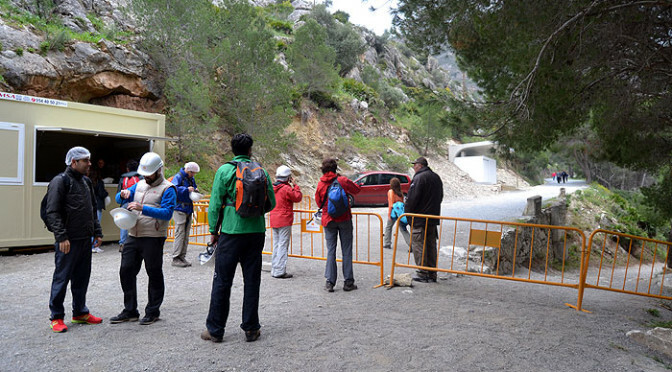 The idea of a guided tour is to be guided so they wont let you wander off on your own on a guided tour 🙂 The Caminito closes for high winds and when it is very rainy… (this causes rockfalls…) If it is a calm day with blue skies the path will be open.. Excellent advice. As Sarah on 5 August, really disappointed not to be able to book tickets as they seem to be sold out for weeks in advance. By chance I found your page and we risked the 2 hour drive arriving just after 10:00. Lots of people queuing with their timed slots but 4 of us were able to walk straight to the kiosk, bought tickets and the staff just fitted us straight into the first group leaving. So glad I found your page. Hi there , when would tickets for August 2018 become available ? I would expect that tickets for summer 2018 for the Caminito del Rey will be opened up sometime in late spring 2018… Normally it is about a month before the start of each quarter… Hope that helps. I have bought 3 tickets so my friend and I can do the trip same time, so I’m selling 1 for the 12th November, 9:30 as we need only 2. Price is £10. Email for it to elacska at gmail dot com. Price is now 18 Euros. Subhrodip – did you get in? Am thinking of going next week but there are no tickets available on line. Latest comment on this subject just before yours “Even though the website showed SOLD OUT we took a chance and went on 11October without tickets. NOT a problem.! There was about 30 or 40 people waiting to buy at the entrance and clearly the staff were well prepared for this. Waited no more than 20 minutes and we were in. Am going to try – thanks! Please let us all know how you get on…. We (2 of us) went last week (mid week) and fine without having tickets. We got there as early as we possibly, taking the first (9am) bus from El Chorro where we were staying. There was a queue for all the ‘non-ticket’ people already in place by the time we arrived of approx 50-100 people and so there was a bit of a wait but we got to the front and let through by about 10.30am. In actual fact not that many people actually joined the queue after us before we got to the front (say approx 30) but that obviously might not be the case every day. That was amazing course and 100% worth visiting. I only have one date to visit the Camino, on the 29th March 2018. I only need 1 ticket and I have a car. It is Easter Week, but not a weekend. Do you think I can take the risk? That’s fantastic news! I was so sad, trying to book and not finding even one free place. We (me& my hubby) want to do it on Saturday, 19th of May or Sunday, 20th. If we go there at 9 a.m in the morning (one hour before they open) would it be enough so we can get tickets for the first entry at 10 a.m. Is it better to go on Saturday or Sunday? Hi, Of course weekends are always busier than weekdays so there is a chance you may not get in but it is worth a try. Get there for 9am, first entry time is 9:30am… Best of luck and have a great day! I have 2 tickets for Sunday 1st April (Easter) at 10.30am. Bought with an agency and we need to be at El Chorro at 10.15. Only train from Malaga gets there at 10.45 though. Anyone is on the same slot and has a car or whats to share a cab? Clive any other ideas in alternative on how to get around this? Hi Clive, thanks for your response. My ticket says that it’s for 10.30 and meeting point is 10.15 at el chorro. I am very confused now? Maybe the ticket includes transport from El Chorro to the start point? Thank you for sharing the information about ticket availability. The only option for us was to attempt to walk in and get tickets the Saturday of Easter weekend. We parked our car at 8:45 and walked the 2.7km to the ticket area. It was a beautiful walk. There was quite a line when we arrived at 9:15, but once they opened, it moved quickly. We were able to purchase 3 unguided tickets and immediately hit the trail. It was breath taking and amazing. If you get there early you can purchase tickets. I highly recommend going! Thanks for that update Jeanne! Warning – we followed this advice arrived today 10/4/18 and walked down to the starting point – no tickets for sale. We saw at least 100 people walking back before us. We were persistent but was advised no tickets on site today – all sold out We tried to book accommodation later on in the week as per advice on this site and advised no tickets this week. It is a long drive but a beautiful area if you get a ticket or not. Do not get your hopes up that tickets will be available on site. 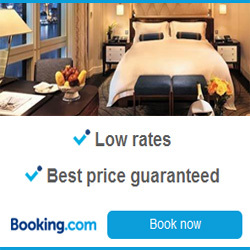 Best advice is book online in advance of your holiday! Hi Marnie, thanks for the update… As the title says in this article “Hopefully”… To be honest you are the first person that has commented that there weren’t any entry tickets at the gate… (Many hundreds of emails and comments say the opposite) Maybe today there was a big group visit or some other occasion that ate up all the tickets at the gate… Of course, you are totally right, the only way to be sure is to keep checking the official website and book your ticket, use a tour company or other local business that provides entry tickets…. Im going to try for a ticket on Tuesday 17th April, wish me luck. Also can you tell me, is it possible to park a camping car at the north entrance, my Husband does not want to walk, but i do, so he will stay at the camping car with our dog, whilst i try for a ticket. Hi Elaine, how did you get on today? Hi Clive. I want two tickets for any day between 21st and 27th May 2018. Web site says all sold out. Is there a good day and time to try from that range? Hi! on the site it’s sold out. do you advise me to try to introduce myself directly at the ticket office on the morning? is there any chance of being able to enter? what time is it better to go? We tried to get in today. There was a really long line and the only people that got in without a ticket arrived at the selling point before 7:30. There were only 50 tickets that were sold out by 9:30. Can prove that it’s only 50 tickets are available for buying at the entrance and they are usually sold in the morning, so you need to be early there, otherwise you can only enjoy the view from hiking trail close to Caminito del Rey as we did 2 days ago. Thanks for that feedback… Good information! Hi! I tried to book 2 tickets on te website but it was already sold out. We wanted to go on the 31st of May, but I saw it was a public holiday. Do you think it is possible to go anyway on that day (without tickets)? Or would the 1st of June be a better option? My girlfriend and I went to the Calimito Del Rey last Tuesday, feeling hopeful we could still get in after reading all the above. We parked our car at 8 am by the kiosk, walked through the long tunnel (1.5 km, fyi) and followed the track towards the entrance. By the time we got there it was 8.15, already 20 people were before us, all without tickets. The entrance opened at 9.00 and there were about a hundred people now waiting, some of them had tickets for the 10am slot. The stewards didn’t really check who had tickets or not, the first 30 people or so were allowed in, and so did we! I guess, because the stewards didn’t really seem to care a lot about the time slot, that ticket sales via the website are very limited. Nevertheless, come very early! The ride there is beautiful, seeing the sunrise over the mountains is a great way to start the day. The park is still quiet and animals are just waking up as well (we saw foxes and ibexes only a couple of meters from us). And most importantly: you won’t have to queue forever not knowing whether you can get in. The walk itself is certainly worth it. It’s not a difficult or long walk, but oh my it’s spectacular! Thank you Clive for making this site! We propably wouldn’t have tried without your advice! Glad to hear that you got in and had a great day Cedric… Did you pay to get in? How much did they charge you? We came there today before 9 am, (+30 minutes walking through tunel and forest). There were already around 50 people both with tickets and without. Unfortunately stewarts were quite strict this time and didn’t allow to buy tickets on place, saying that everything is full for whole day. Maybe because it’s friday and lot of big tourist groups were comming by buses. Nevertheless the road and the views were amazing. Maybe we’ll try our luck next time. Ohh thats a shame Andrew, but, thanks for the feedback… It seems that turning up even as early as 8 am is becoming a bit of a lottery! Today we got in without prebooked ticket thanks to this guide. Arrived at north entrance gate at 8.40 and there were about 20 men in the queue before us. When gate opened, queue without tickets had ca 100 men. We were let in with the first group and saw that the end of the queue was discarded. Guy from staff told them smth. and people went back. Glad to hear that you got in Ok and this site helped! We’re hoping to visit 2nd week of October (any day Tue to Fri) but no individual tickets are left. We’d need to travel by train from Malaga which arrives about 11:00 I think, is that too late to risk the queue for allocation on the day do you think? Looks like we could get in a group tour though, just hoped to go alone as groups tend to be slower…. I would book the guided tour for the dates that you want…. Many people have commented that the tours are very good, informative and worth the small extra cost. Hi Clive I am planning on staying in Seville and booked a 1pm ticket for 14 September, the train home to Seville arrives at like 530 pm so I’m worried I won’t be able to finish the hike, and get the bus to the train station before 530. Any thoughts on this? Also what is the toilet situation? How many / where are the toilets located and what’s the distance / time between them? I’m imagining it’s a 3-4 hour journey from start > finish with only one toilet at the start? Re toilets, there are none along the walkway. Just at the beginning of the walk so go before you start! 🙂 The walkway is around 2 to 3 hours or quicker depending on your walking speed. Hi, thanks for a good advice. There were no available tickets on web site, but we booked a package at La Garganta (room + entrance ticket). You are welcome and happy to hear that you got in for the walk. Hope that you had a great day! We bought the tickets today at the entrance (about 9am). The price was 10 €. The queue was not long, about 30 people before us. We were allowed to start our journey with the second group at 9:30. Definitely worth waiting – el caminito is amazing!! Hi Bianca… I think either day will be busier than the weekdays…. Best of luck! Get there as early as you can, like 08:00 and definately before 9am. we will be in Malaga from 20 to 28 Octobre. Which date would you recommend us to visit el Caminito? There are 5 of us. Are there not any holidays or school holidays in these days? Hi Pavla, it is not really about choosing a date but getting any date that is available… be quick as tickets sell online very fast. There may be a guided tour option if there are no self guided entries available.. Arrived at 8:45 today and there were about 30 people in line. We got a ticket and so did everyone else that arrived until 9:30. Not sure about later because we started walking. Thanks for the feedback Ron and very happy that you managed to get in and do the walk! Hi, We are on a family vacation from the 13th To the 19th October in Marbella. We tried to get tickets for fantastic camino del ray but there is unfortunately sold out. Can we ve lucky to get tickets if we drive up to the entrance. Always worth a try Michael but get there as early as you can… People are commenting that they are in the queue by 08:30 in the morning. Best of luck and let me know how you get on. Thanks! My husband and I are hoping to walk the Caminito on Thursday – as it’s January and a weekday there doesn’t seem to be too much of a problem to get tickets online. BUT. We have a 17 month old daughter….We know we are not allowed to take her on the Caminito, so we were thinking that I will do the walk in the morning and my husband will do it in the afternoon. If I bought a ticket for 10am and my husband got one for 2pm, do you think that will be enough time for me to do the walk and get back to the start point to collect my daughter in time for my husband to make his start time?? We are both fit and healthy and not too slow! Hi Kim. You shouldn’t have a problem finding somewhere to park your moto. The shuttle bus leave every half hour or so and you can include that when you book online…. That said there are very few places left on the online booking system…. Was looking at getting tickets via a touroperator, but would prefer to go without a guide. Do you know any options for this? Don’t mind paying a bit extra for just tickets without a guide, but not like 45 euro pp. We plan to stay near Alora so around half an hour to Caminito del rey by car. Would we have a good chance if we show up early? And how early would we have to be there you think? Thats such a shame the weather forced the Caminito to close for the day but I am glad that you had a good day out! Thankyou so much for the feedback about the train tickets and the refund available… Very good news because refunds from the official websitre are a bit complicated sometimes.